UK insurers’ nine month results provide a useful gauge of the industry’s performance before it enters the final quarter of the year. Here, GR’s sister title Insurance Times gives its guide to the 10 key themes that emerged from the latest reporting season. For the most part, UK general insurers are continuing to prune their books of unprofitable business amid heavy competition and weak pricing. 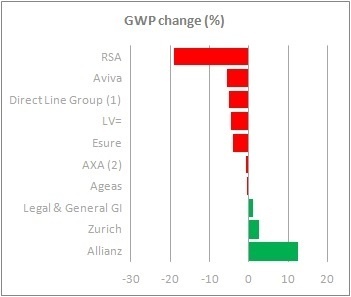 The collective gross written premium (GWP) for the 10 large insurers studies here was 3.8% down on levels reported in the first nine months of 2013. Only three of the 10 firms were able to grow GWP (see chart). RSA suffered the biggest drop in premium volume in the first nine months of 2014. It shed £455m of net written premium, giving a total for the period of £1.95bn. This was 18.9% down on the £2.4bn of net premium the company wrote in the same period last year. The company is in the thick of turning around its performance after a torrid year to date, so it is no surprise that it has shrunk more than its rivals. Allianz saw the biggest boost in gross written premium by quite a way. It wrote an extra £181.2m of business in the first nine months of 2014, boosting GWP by 12.4% to £1.64bn. While its commercial book grew, the bulk of the expansion came from personal lines, where GWP rose 20% to £836.5m. The company wants its personal lines business to be in the top five by 2018. 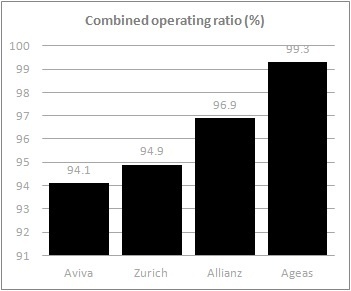 But the growth has come at a cost: Allianz’s personal lines combined operating ratio (COR) for the first nine months of 2014 was 100.2% – 5.7 percentage points worse than the 94.5% it reported in the same period last year. This was mainly caused by increased marketing and IT spend, as well as weather claims in the first quarter. Of the four companies that reported a nine-month COR, Aviva’s was the best. It reported a COR for the period of 94.1%, which was 1.4 percentage points better than the 95.5% it reported in the first nine months of 2013. Zurich was not far behind, reporting a COR of 94.9% for the first nine months of 2014. It also saw the biggest improvement in its COR, which fell by 3.2 percentage points. Several companies, including Direct Line Group, Esure and Admiral, noted an increase in bodily injury claims when they reported their results. But not all companies are experiencing the same trends. Esure chief executive Stuart Vann, for example, noted an increase in small bodily injury claims. Direct Line Group, meanwhile said it had suffered higher than expected large bodily injury claims in the first nine months of 2014, which was partly offset by a lower level of small claims. Commercial lines have been a thorn in the industry’s side for several years from an underwriting profitability perspective. But some companies are keen to grow their commercial books. O’Roarke said LV=’s commercial book is now making an underwriting profit, and that he saw a “big opportunity” for LV= to take more commercial market share. The company’s commercial GWP grew by 15.6% to £170m in the first nine months of 2014. Allianz UK boosted its commercial GWP by 5.5% to £805.1m in the first nine months of 2014.